So here I am now in Shanghai, China, the city, which has arguably the largest urban-population on earth and still grows further with incomparable speed to yet unknown heights. A city that could easily be regarded a country of its own, if it were just for the numbers (approx. 25Mio inhabitants [cf. Shanghai Bureau of Statistics 2014]). An international metropolis, thriving in terms of contemporary culture, education and economy. The commercial and financial backbone of the People’s Republic of China, its “door to the world”, so to speak, and thus a centrepiece in the countries plans to become the economic frontrunner of all nations within the 21st century. One can either love or hate Shanghai for those reasons. What the city offers in terms of its contemporary-cultural attainment, international character, and flagship-stores, it in some ways lacks in traditional Chinese features and thus authenticity, at least in the Down-Town areas. To a certain degree however Shanghai always fitted the description of such an urban hybrid, drawing settlers and merchants from abroad especially since the latter half of the 19th century, first from Britain, then France and lastly from everywhere else, while already cracking the Top5 of Most-Populated Cities Worldwide once within the 1930s (cf. SHTong 2016). In the meantime the small fishing village, which Shanghai used to be in ancient times, has undoubtedly become one of those few globalized metropolises that fascinate and inspire so many, not least in their pursuit of happiness and self-fulfilment. So what am I here for? One might ask. The answer in short: “unfinished business”. However there’s a little bit more to it, as I’m certainly not referring to the the kind of business that the city is so famous for. I’ve already been to Shanghai once in 2010, visiting a friend. Back when the city held the PRC’s very first World’s fair or EXPO, which soon after would be known as the biggest of all time (if you don’t yet know, what an EXPO is, you better wiki that quick -> World EXPO). Being one of its 73 Million attendees and a first-time visitor to China (several trips would follow), I was literally blown away by the sheer magnitude of this exhibition and the city itself. Back then I already felt that my experiences would weigh heavier than mere holiday memories. Also because my whole agenda was a different one. When I set sail towards China for the first time that very year, I was already in my twenties but have never been abroad in my life for more than two weeks and certainly not outside of Europe, despite those infamous Turkish/Tunisian all-inclusive hubs. What a poor résumé for a cultural anthropologist – even worse than that – I needed to deliver a piece of empirical research to receive my Bachelors-Degree rather soon. So when my friend, who then was working at the EXPO, invited me to crash his place for the summer, hinting that I could do my research on the EXPO grounds as well, I of course jumped at the opportunity and onto the next plane to Shanghai. I was finally about to see the world, literally speaking. 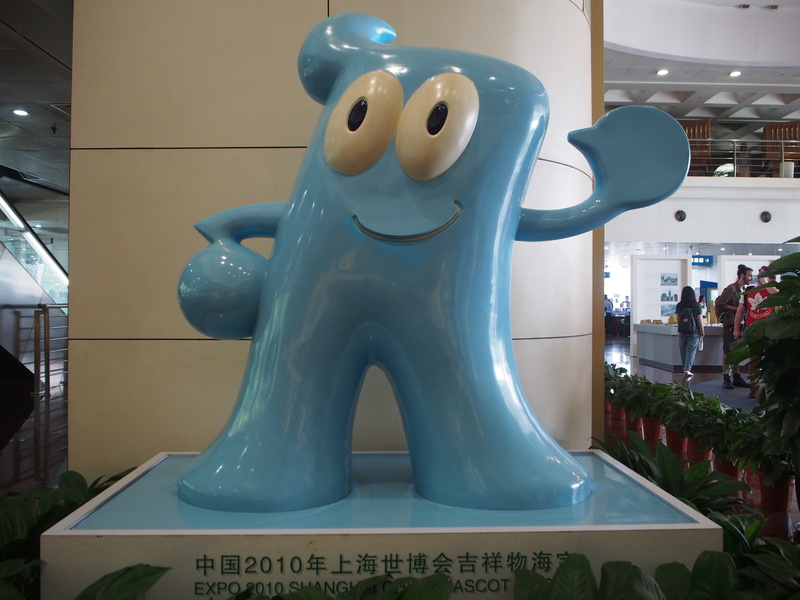 HAIBAO, Mascot of EXPO 2010, greeting visitors in the entrance hall of Shanghai’s Urban Planning Museum. If you go somewhere else with a question at hand, like “What are Chinese tables manners like?” or “Why do I have to pay four times as much for that watch than the local?”, chances are high that you’ll learn much more about a place then the average tourist does. I was fond of both Shanghai and the EXPO upon my arrival, conveniently the latter was themed “better city – better life”, marketing Shanghai as the city of the future, so I just put a question-mark behind that statement and -tadah- had found myself a research question. What followed was a month-long engagement with the World EXPO as well as its participants and visitors but also Shanghai, its people as well as Chinese culture and policies. Not an easy task for someone, who was practically more accustomed to all-inclusive venues than foreign cultures up to that point. It would work out just fine after all, fitting the bill as a piece of empirical research at least in modest Bachelor-terms. However – what’s more important – my interest for both, China as well as the EXPO would stick with me over the years, as I’ve been to the PRC on several other occasions after that, studied the language and culture and also made a lot of new friends abroad. The EXPO on the other hand has become the main field of interest within my PhD studies, which I would certainly like to tell you more about. I’m afraid though that you have to wait for that a little longer, just count it to the unfinished business, I have to attend to. Of course I also still have to see, what has become of that place once known as “the city of the future”, and if it has changed in the meantime. It has changed me that’s for sure.